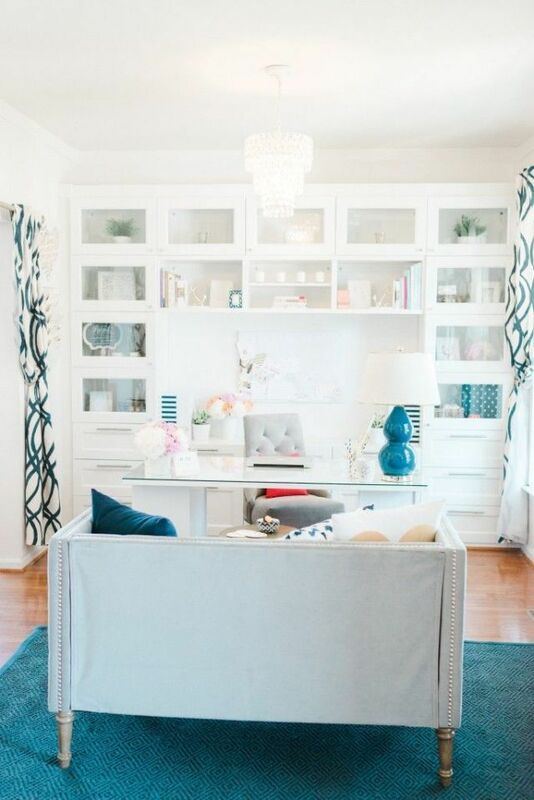 Whether it’s working from home, doing a few admin tasks or the kid’s homework, more and more of us are looking to incorporate a study area in our home. However, very rarely do most homeowners have a dedicated room that they can simply turn into a study, so a clever use of space is key. With thoughtful planning and creativity, almost any space in the home can be turned into a useful home office. Having a home office might seem like an impossible dream, but it’s easy to fit one into your home when you know how. Whether you have a dedicated home office room or you’re hoping to create an work or hobby area in your living room, dining room or even bedroom, we have all the inspiration and advice you need. 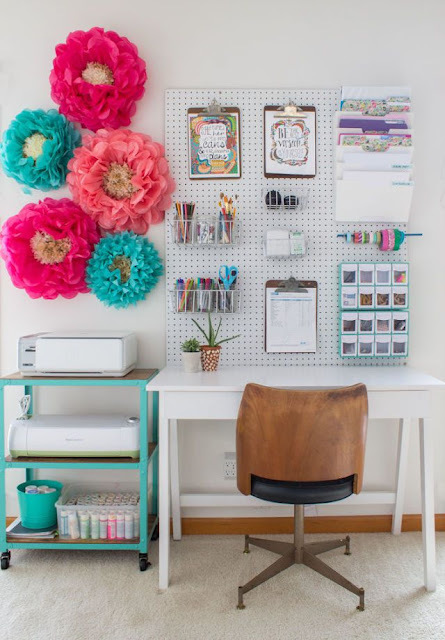 Decorate your work space with quirky accessories—like these oversized paper flowers—to make it feel truly unique. Use colorful, patterned drapes to add interest to a space filled with neutrals. A lengthy desktop gives you plenty of space to store items and work on various projects. Make your office feel airy and sunny by using white throughout. 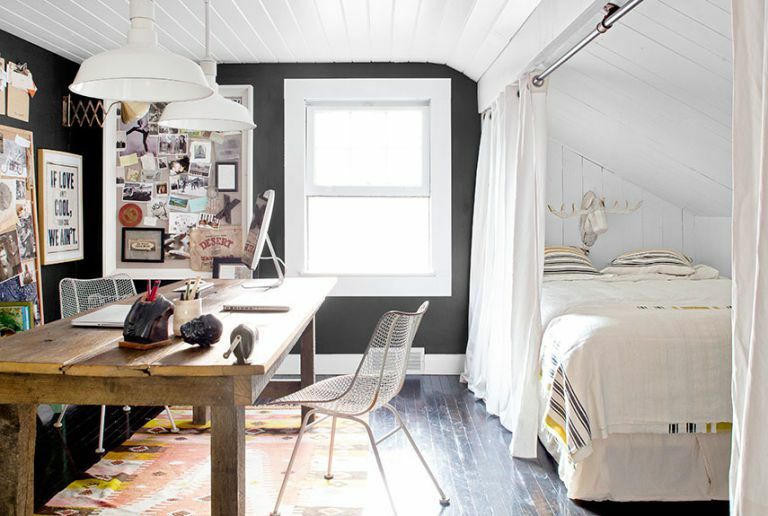 Delineating the office and the guest bedroom in this Pennsylvania home: Ikea curtains and chalkboard paint. A hole in the secondhand kilim rug provides a conduit for computer cords. The desks in this North Carolina lake house's office are made from salvaged pipes and old doors. The homeowners created unique wall decor by framing blueprints of their home. With a carefully considered layout, it is possible to turn a guest bedroom into a dual-purpose space that can accommodate overnight guests and also work as an office. Keep the sleeping area well defined and choose a desk that suits a bedroom setting. This versatile arrangement allows the bedroom to function as an office when necessary without looking like one. Make a corner of a room an obvious office area, by virtue of a meaningful wallpaper. The design seen here features words hidden within a grid of calligraphy-style letters, making an intriguing puzzle. With a patterned wall like this choose simple, contemporary furniture to complete the look and add one strong accent color too add interest. A smart, ordered scheme creates an inviting work space. A large desk is ideal for using the computer and can be cleared and left clutter free by making use of the wall above. 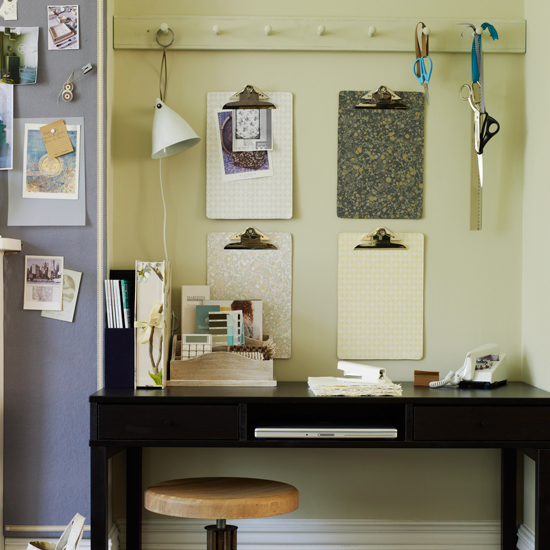 Hang up clipboards for simple, easy-to-access notes and fit a standard peg rail – a great solution for hanging and storing essentials. The hallway landing is a space that is often overlooked, but if it is large enough it can provide an ideal spot for a small home office or work space. 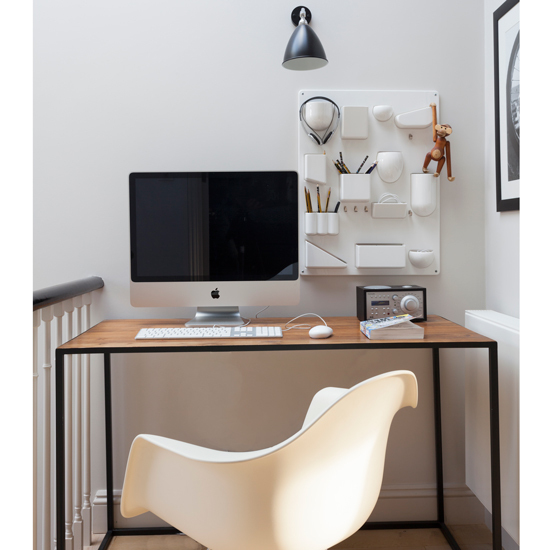 Use wall-mounted shelves, storage units and lighting to keep things in order and free up extra space on the desk.